Heat oven to 450ºF. Cut four 18x12-inch sheets of aluminum foil. Mix beef, Worcestershire sauce, 1 teaspoon garlic-pepper blend, the onion powder and salt. Shape mixture into 4 patties, about 1/4 inch thick. 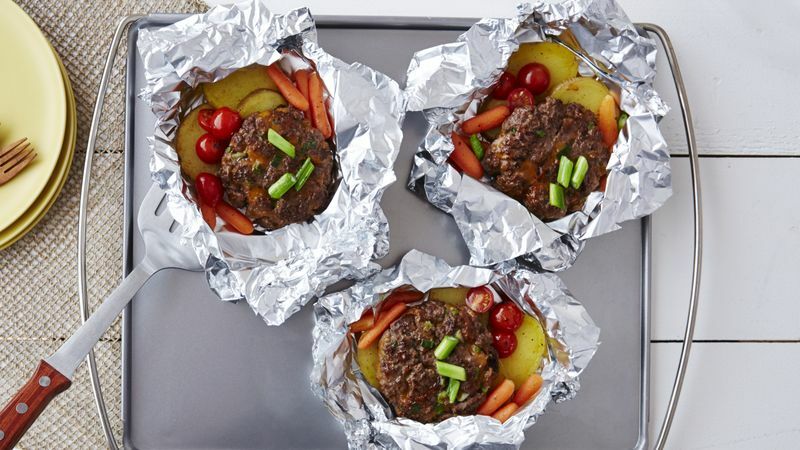 Place 1 patty on each foil sheet about 2 inches from 12-inch side. Top each with 1/2 cup vegetables and 8 steak fries. Place 1 piece of corn next to each patty. Divide remaining 1/2 teaspoon garlic-pepper blend among vegetables. Bring up 2 sides of foil so edges meet. Seal edges, making tight 1/2-inch fold; fold again, allowing space for heat circulation and expansion. Fold other sides to seal.Place packets on large cookie sheet. Bake 35 to 40 minutes or until meat thermometre inserted in centre of patties reads 160°F. Place packets on plates. To serve, cut large X across top of each packet; carefully fold back foil. Substitution: If you don’t have garlic pepper, use 1 teaspoon seasoned salt or 3/4 teaspoon salt plus 1/4 teaspoon garlic powder. Success: Use extra-lean ground beef so veggies won’t cook in too much beef juice.